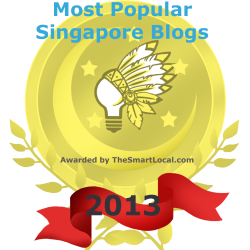 I had written this article for the We The Citizens Of Singapore citizenry journalism website. The article was initially published at this link here. The Straits Times had reported on 3 August 2013, in the article titled, “6 in 10 Singaporeans feel they have good jobs: Survey“, that, “six in 10 people (say that) their jobs are good” (Chart 1). The Straits Times’ survey was conducted by Degree Census Consultancy from 20 June to 2 July. I was unable to locate more information about the survey or its methodology on their website. 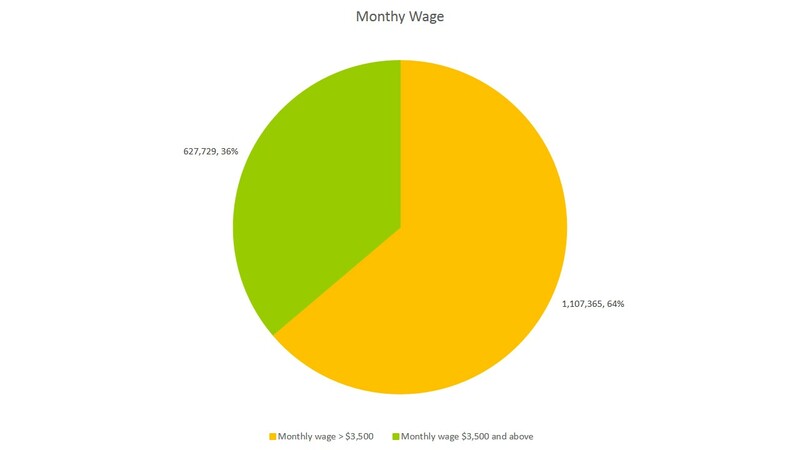 However, if we were to look deeper into the definition of a good job, in terms of the first descriptor on the pay and benefits, I had written previously that a Singaporean who is single would need to earn a starting pay of at least $2,000 every month in order to have a basic standard of living in Singapore. 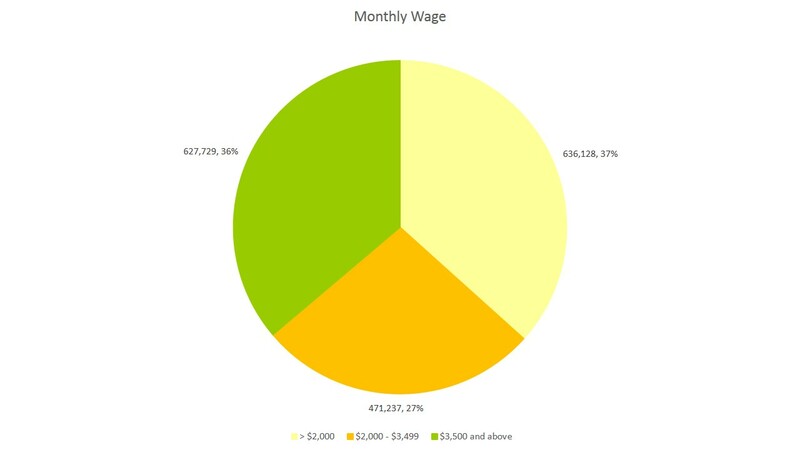 For a family of four, each parent would need to earn a starting pay of at least $3,500 every month in order to do so. According to the CPF Board, 64% of Singaporeans earn less than $3,500 in Singapore (Chart 2). Thus looking at the statistics, would 64% of Singaporeans not have a good job, if we look at it in terms of pay and benefits? Next, if we were to look at the second description of a good job – work-life balance, Singaporeans actually works the longest hours in the developed world (Chart 3), according to the International Labour Organisation. 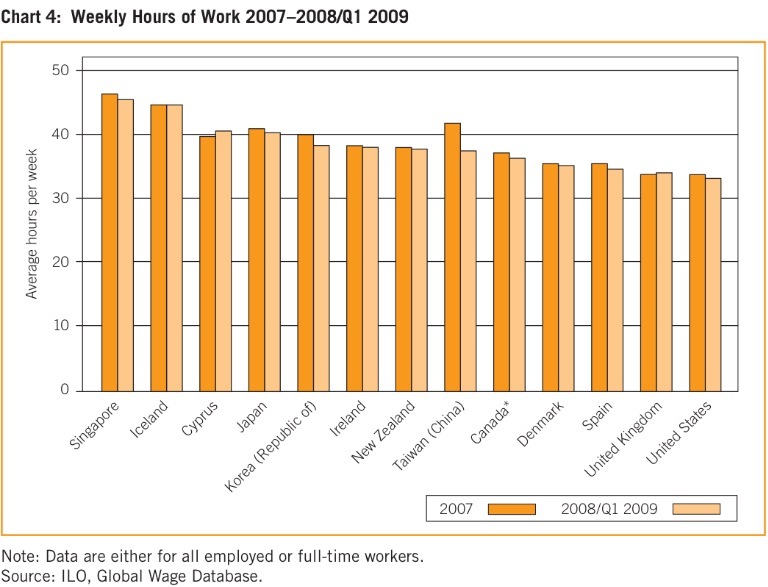 Thus in terms of work-life balance, it might seem that Singaporeans do not have a good job as well. 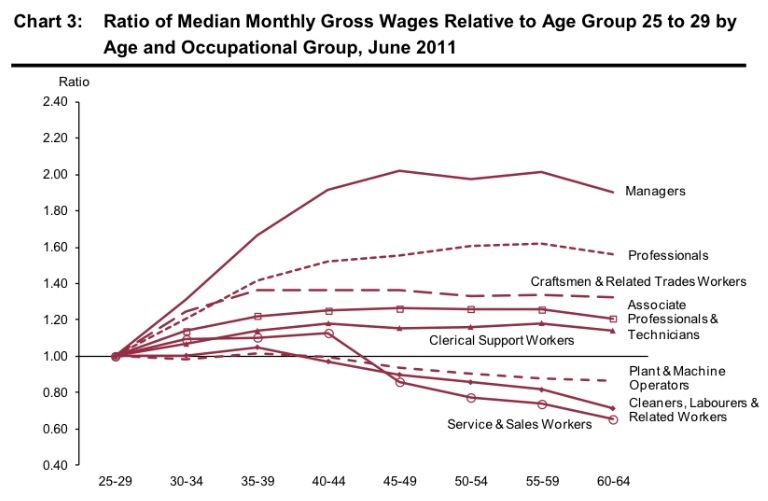 Finally, if we were to look at the last description of a good job of career advancement, according to the Ministry of Manpower, for middle-income earners, their wages will stagnate after they reach 40 years of age and for low-income earners, their wages will actually drop (Chart 4). So, for the 64% of Singaporeans who are earning less than $3,500, this would mean that they do not have a good job, by this definition. 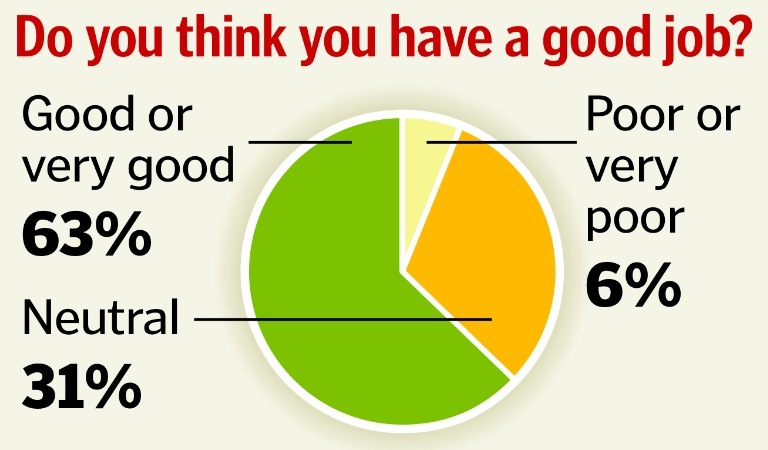 The Straits Times had reported on the respondents’ self-reported perceptions of the goodness of their job. However, the actual measured reality of the survey descriptors of a “good job” might paint a less favourable picture. Even though The Straits Times had reported that 63% of Singapore residents think that they have a good job, the statistics show that by the same definition, 64% would actually not be having a good job and only 36% of Singaporeans can be considered as having a good job – it is the other way round. Perhaps a more reflective result would be the next question that The Straits Times had reported. When asked about “job prospects of the next generation”, 40% had believed that prospects would be better or much better whereas 41% believed that they would be worse or much worse (Chart 5). This brings to mind another set of statistics that I had come across. As mentioned, according to the CPF Board, 37% of Singaporeans earn less than $2,000 every month, while 36% of Singaporeans earn more than $3,500 every month. If we put this into a chart, Chart 6 would be what you would get. The breakdown in Chart 6 actually looks very similar to Chart 5. Could it be that the perception of the job prospects of the next generation is also weighed in by the current wages that Singaporeans are receiving as well? Are future job prospects a reflection of the wage sufficiency that an individual would require in order to have a basic standard of living in Singapore? If so, do 41% of the respondents believe that they would not be able to have a basic standard of living in Singapore, and thus believe that job prospects would be worse or much worse? The Straits Times had reported that “there are as many pessimists as there are optimists among the 501 surveyed”. Again, this brings to mind another survey that was recently conducted the Gallup. On 18 July, Gallup reported that Singapore was the 10th most pessimistic country in the world, among 141 countries. 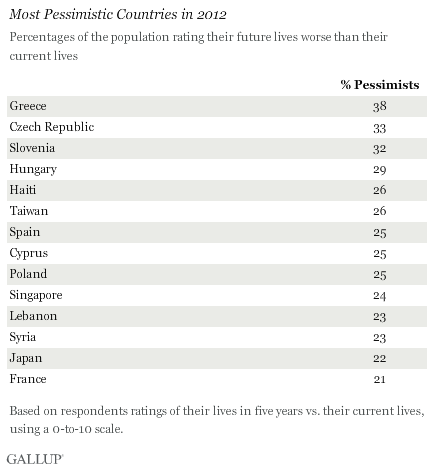 24% of Singaporeans were pessimistic about the “about the direction of their lives” (Chart 7). 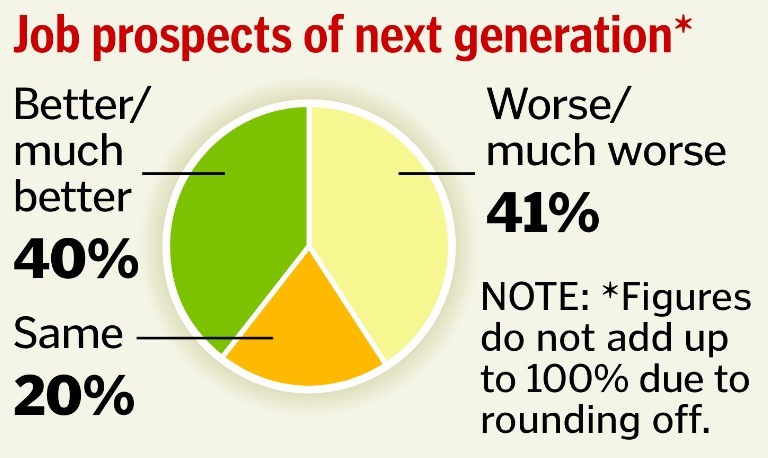 In the survey reported by The Straits Times, 41% were pessimistic about job prospects of the next generation. It seems that the survey conducted by The Straits Times does lend credence to the Gallup survey that Singaporeans are pessimistic about their “future lives”. This also comes after surveys conducted by the Gallup which had also ranked Singaporeans as the most unhappy (Chart 8) and the most emotionless (Chart 9) people in the world. These surveys of Singaporeans’ disfranchisement with the state of Singapore are a reflection of the unease that they feel in their livelihoods and their ability to live a good life. If we are to look deeper into the statistics, it is clear that income inequality is on the rise and the self-sufficiency of Singaporeans to live even a basic standard of living is being called into question. As such, it would be wise for our policymakers to look at reforming key policy areas so as to bring Singapore back into parity. One of the key policy areas to reform would be to uplift the wages of lower-income groups, by implementing a minimum wage law, or to increase significantly the income transfers to the lower-income groups. Another policy area to look at would be to reduce the number of work hours to allow Singaporeans to achieve better work-life balance. The recent surveys which has illustrated Singaporeans’ disfranchisement and their consistency is a reflection of Singaporeans’ distrust and lack of confidence in the current direction of Singapore’s policies. It would be wise if our policymakers were to take these survey results seriously and act accordingly to respond to Singaporeans’ needs. Singapore is clearly at a turning point in our country’s history. The income inequality and the rich-poor wage gap has increased so drastically that it has reached saturation point. If the disparities are allowed to continue, there can be serious consequences to the stability of our society. 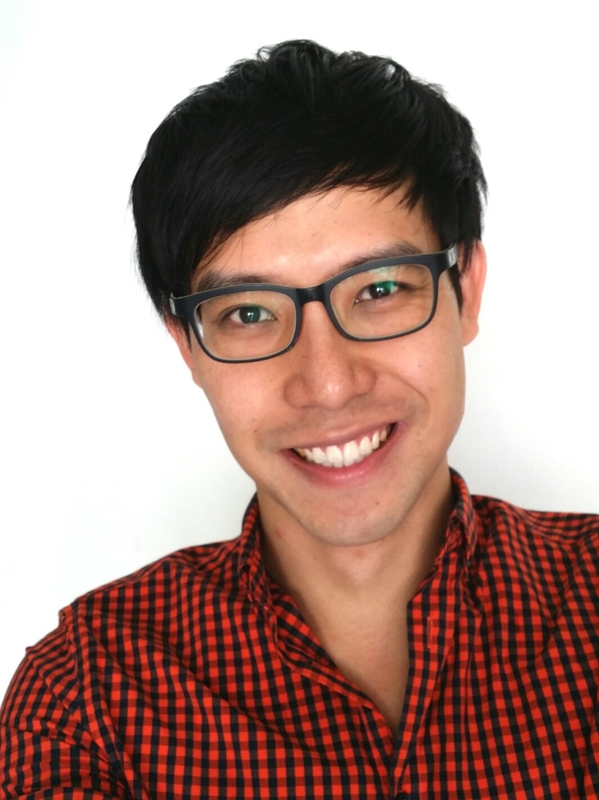 It would be pertinent for our policymakers to relook their planning fundamentals, to shift into adopting principles of equality, so that Singapore can introduce policies which can stabilise our society that the societal rifts are threatening to destabilise due to the tensions that the financial disparities are creating. YOU CAN ALSO SEND YOUR COMMENTARY TO WE THE CITIZENS OF SINGAPORE. You can also send your thoughts on any issue that matter to you. You can read more about the commentary guidelines here.